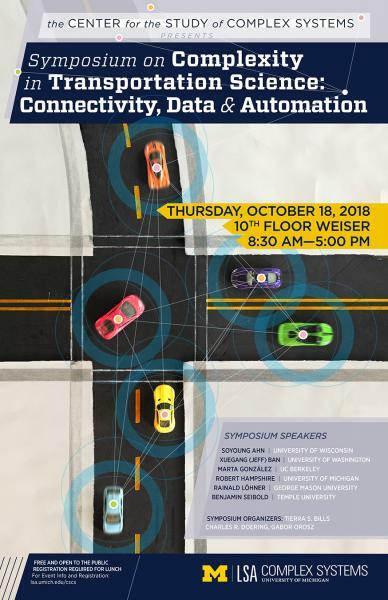 Symposium on Complexity in Transportation Science: Connectivity, Data & Automation. "Traffic Waves, Autonomous Vehicles, and the Future of Traffic Modeling"
"A stochastic modeling of traffic breakdown for freeway merge bottlenecks"
"Transportation Big Data: Promises and Issues in the Era of Connectivity, Automation, and Sharing"
"Smart Cities: Data and Decision science for parking management"
"Data Science to tackle Urban Challenges"
"Crowd Management Via Multisensory Input, Fast Computing, Data Bases and Deep Learning"
For abstracts and biosketches please click the "ABSTRACTS AND BIOSKETCHES" link below. See below to register for nametag (until noon Oct. 17, 2018). Lunch registration is closed.